Have you ever seen ants work? 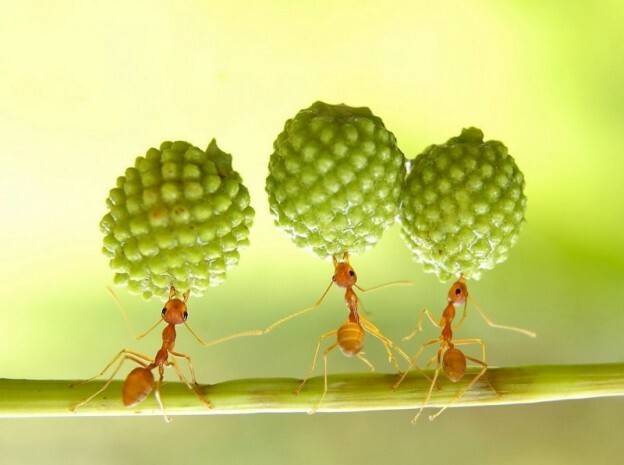 I know it sounds ridiculous to start a lesson with that, but really, have you ever looked at ants and how work together? They work so well with each other, even without a leader, and yet they get things done, and they get them done together. The Bible actually mentions ants in Proverbs 6:6 and in 30:25. If you look real hard, they are carrying food, protecting their land, and even carrying their wounded off to safety. We try and do everything on our own without anyone’s help and along the way we’ve convinced ourselves that we’ve brought some good to the world by being independent. And the truth is, we actually need each other. Within this time of Christian community we see so much life, teaching, and love on the part of everyone. I know for most of us as people, we desire this. I love this is quote by Bill Clem, “A community of believers following Jesus can image God in ways that an individual simply cannot.”1 If you really pay attention to any book of the bible, most of them are full of commands and graces that are meant for listeners that in a community context rather than an individual. This word community has been distorted over the years and will probably conjure up ideas of communism or exclusive types of cults. This is not the case, God has a plan for us to work and image Him together. We must get out of our lone-ranger mentality of life and ministry. There are marks of a Christian community worth mentioning, so that imitations can be easily pinpointed. First, a Christian community worships. This means that a Christian community loves truth, prayer and enjoys eating together. Second, there is belonging that cannot be found anywhere else in the world because there people that forgiven by Jesus, so they forgive. A beautiful picture of belonging is when Jesus washes Peter’s feet in John 13; we see the perfect example of servant leadership and refreshing friendship. And third, we image God together on mission as a witness.2 When we love the world together, more can happen then what we could ever do on our own. The real question begins to be, are you a consumer? Or are you a giver? How would it look for our church for these descriptions to be true in our setting? Does this excite you? Why? Does this concern you? Why? What type of distortion do you see you most prone to be involved with; therapy, network, program, or exclusive? Take time now and plan to go to dinner or lunch with a group and find ways to integrate each other into the rhythms of everyday life. This might seem uncomfortable, but you all are mature adults, make it happen. For a lot of people, the use of imagination sounds secular, though it can be secular, it doesn’t have to be. The imagination can be used5 to the glory of God when fenced in by scripture, God gave us our imagination. Spend time in prayer and worship imagining in your mind the beauty of God and joining with other faithful followers in worshiping Him. Imagine what it can look like to be faithful Christians together, and mirroring the church as described in Acts chapter 2. Are you currently in community with other Christians, besides scheduled gatherings like Sundays or required meetings? Read the beatitudes in Matthew chapter 5. Could these teachings be applied to both an individual and in plurality? If so, why? Look at the beatitudes, and make note in your journal how each can be applied in your personal and community life. While considering your family first, go out of your comfort zone and invite a family in your neighborhood to dinner inside your home, or out to a restaurant if you feel safer with that. I know, big step, but you’ll be surprised what doors can open when steps of kindness are pursued in the Name of Jesus.